Oh, sleep. It’s a wonderful and rare thing after you have a baby. Luckily there are products available that can help you help your little one get some much needed sleep. Here are my top must-have baby sleep products for newborns to 6 month olds. First things first, baby needs a safe place to sleep. You need to decide if you are going to do bed-sharing, have a co-sleeper, a bassinet, or have baby sleep in a crib. There are many different options to choose from. One that I love and recommend is the co-sleeper from Snuggle Me Organic. What’s cool about the Snuggle Me is it’s the first and only baby lounger designed to hug. The center area of the lounger is unpadded and slightly suspended so when you lay your baby on top of the unpadded space, the sides of the lounger will pull in, giving your baby the feeling of a sweet hug and snuggle. The Snuggle Me’s tight torso fit contours to your baby’s head and torso while their legs will drape over the bottom end. 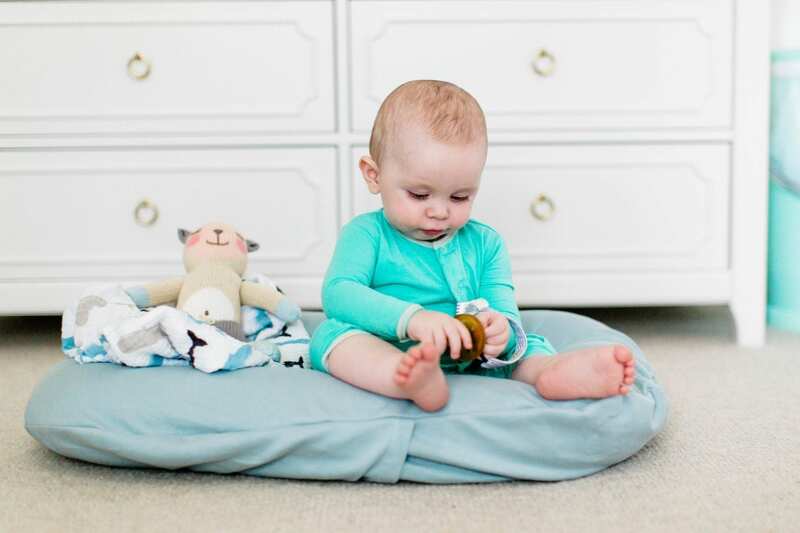 This tight fit design ensures baby will stay safely on their back while lounging. This is an important design feature that sets the Snuggle Me apart from the rest. Another thing that I particularly love is that every element of the Snuggle Me is made and sourced from local, USA makers and manufacturers. They use GOTS certified organic fabrics, and the difference in quality can be seen in every detail. Snuggle Me is offering a 15% discount for Baby Chick readers with code BABYCHICK15. You won’t regret the amazing night’s sleep you’re baby is about to get. The quickest way to calm your little one down when they are upset or restless is to hold them and emulate all the sensations baby felt while in the womb. One of those sensations is being tightly held in your uterus. The best way to mimic that snug feeling is by getting baby in a good swaddle. A swaddle that I recently found that is really cool is the Swado. What makes their swaddle stand apart from the rest is the patented Goodcatch fastening fabric they use, which makes it a silent swaddle. When I say silent, I mean that there are no zippers or velcro that can wake or startle your baby when changing a diaper, etc. Basically it’s a fuss-free, easy-to-do, silent swaddle. See how the Swado can grow with your baby from both arms in, transition from one arm out to both arms out for a great wearable blanket. A few other things that I want to highlight about this swaddle is that it’s hip-healthy. (It was recognized by the International Hip Dysplasia Institute as A Hip Healthy Product, that promotes healthy hip development). I can quietly change baby’s diaper and keep baby’s arms down and wrapped at the same time, and it can grow with your baby and be used through the first year of a life, which saves parents’ money in the long run! You may not know this, but it’s very loud in utero. While you were pregnant, your baby heard your heart pump blood, your lungs inhaling and exhaling, your voice as you spoke, the blood rushing through your veins, and food and gases being passed through your body. This is why dull loud noises will lull your baby to sleep. Instead of running the vacuum or your hair dryer to calm baby to sleep, there are actually some awesome white noise sound machines that can help. A few that I recommend are the Hatch Baby Rest, Marpac’s Dohm. Or if you’re on-the-go the Marpac Hushh or the Baby Shusher. It is very important to establish day and night with your newborn. They need to learn that we are awake and play when it’s light out and go to sleep when it’s dark. Sleeping in the dark actually helps produce the hormone melatonin, which helps regulate night and day cycles or sleep-wake cycles. Keeping baby’s room dark will help your baby sleep better so getting some good black out curtain can help create a good sleep environment for your baby. Here’s a good set if you don’t have some already. The sucking reflex helps babies calm down and stay calm. Thumb sucking or pacifier sucking lowers the heart rate, blood pressure, and stress levels. Also, reduces crying after shots and blood tests. Once you have baby snuggly swaddled, white noise playing, the lights down low, and a pacifier in their mouth, this can dramatically help soothe an upset baby and help them drift off to sleep. A few good ones are Natursutten, MAM, Avent or Wubbanubs. Babies love motion. When they were in the womb they were rocked to sleep by your movement every day. This is why they fall asleep when being held and rocked in your arms or when you drive around in the car. A baby swing can become your baby’s (and your) new best friend. I must mention that baby swings are not made for sleep so it’s not recommended that baby sleep in a swing unless you are awake and close by. If it’s daytime and baby naps in the swing, there is no need to wake your baby if you’re keeping an eye on your little one. So many parents swear by them. Two that are great are the Fischer Price swing and the 4moms rockaRoo. I actually recommend reading a baby sleep book (or two) before baby is born to determine what your family plan is for baby’s sleep. There are so many methods out there. For example, Baby Whisperer, Healthy Sleep Habits, Happy Child, The No-Cry Sleep Solution, The Baby Sleep Book, and The SleepEasy Solution. Do your research and have a game plan for your baby’s sleep routine. Infant massage is a great way to help baby relax and get ready for sleep. A lot of parents prefer a non-scented lotion or oil to avoid any possible allergic reactions, chemicals or dangerous fragrances used inside scented lotions or oils. Good lotions that I recommend for babies are Earth Mama and California Baby. For good massage oils I recommend coconut oil, grapeseed oil, or sunflower seed oil is perfect. There are several essential oils that are great to promote sleep for babies. They are Lavender, Vetiver, Roman Chamomile, Ylang Ylang, Bergamont, Sandlewood, Marjoram and Cedarwood. Choose one or two as a combination and diffuse a few drops in baby’s room. It can help baby get into the perfect state of relaxation and peacefully sleep. These next two products are more for you than for baby. It’s reassuring to see and hear baby breathing deeply and sleeping peacefully. It’s also good to know when they wake and need you. You can see if something is wrong, if they are looking for their pacifier, or if they are hungry. Getting a baby monitor with night vision and two way communication is a wonderful tool. The monitors that I love are from Motorola, Infant Optics and Nest. We used the Owlet on our son and I cannot tell you enough how much it helped me and my husband sleep easier at night. It was great knowing that we had the Owlet “watching” our son as we all got sleep. Tons of parents have said the same. It’s a wearable monitor that tracks your baby’s oxygen levels and heart rate and alerts you if either go outside the range of normal. I can’t recommend it enough. Check it out here. Here’s to better nights and better naps! 🙂 Let us know if there are any other sleep products that helped your little one! Sleep Tips: So You Think Your Baby is Teething?